Monday, April 1st, at 7:30pm, world class Jazz vocalist, songwriter and recording artist Jacqui Naylor will be joined by Art Khu on piano. Khu is a multi-instrumentalist, arranger and composer. The duo will give a short concert followed by a Q&A session and Master Class. All are welcome. Those who wish to participate in the Master Class, to take place after the brief concert, should should bring their instrument and sheet music. Tickets for the performance are $25 General Admission. Students with a valid ID $8, and Seniors with a DHS ID or equivalent $8. You may also buy tickets at the Door for the event. 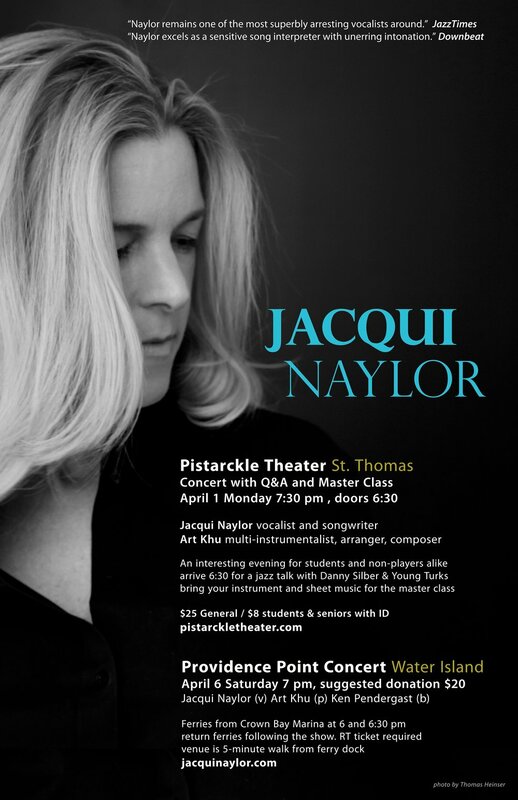 San Francisco CA March 2019---San Francisco-based jazz vocalist and songwriter Jacqui Naylor returns to the U.S. Virgin Islands with a concert and master class on St. Thomas Monday April 1st at the Pistarckle Theater and a concert on Water Island Saturday April 6 on Providence Point. She returns to the islands as part of a spring tour that includes shows in the Bahamas, New Orleans, Hamburg, Lisbon and other European cities. Performing and teaching with Naylor is multi-instrumentalist, arranger and co-composer, Art Khu. Philadelphia bassist Ken Pendergast joins them on some of the dates. Naylor has recorded ten albums since 1998 with her duo and quartet and a documentary film was made about her in 2013. Many of her albums make “top-ten” lists of USA Today, Jazziz, The Washington Post and more and the singer is recognized for her wide vocal range and ability to mix and “smash” multiple genres and generations of music. She is equally at ease singing the music of Johnny Mercer and Jimi Hendrix as she is her own original music, with several compositions used in national advertising. Naylor is perhaps best known for the arranging technique she coined “acoustic smashing” where she sings the melody and lyrics of a jazz standard over the groove of a well-known rock anthem or vice versa. Check out the singer with her quartet on a version of the Rodgers and Hart classic “My Funny Valentine” over ACDC’s “Back In Black.” The artist has likewise been praised for fresh takes on contemporary tunes like Bowie’s “Space Oddity” and a popular Bossa Nova version of REM’s “Losing My Religion,” featured on So You Think You Can Dance for a tango competition. What: 30-minute live concert with jazz standards, covers and original music followed by a 60-minute master class. Those who wish to participate in the class should bring their instrument and sheet music.